Athenex (formerly Kinex) to invest $1.62 billion in drug discovery and advanced manufacturing partnership, creating 900 jobs in Dunkirk and 500 jobs in Buffalo over the next ten years. State investing $225 million to support the Buffalo Medical Innovation and Commercialization Hub and help create new opportunities for the region. Governor Andrew M. Cuomo today announced a major expansion of Athenex that will create 1,400 jobs throughout Western New York. This announcement, made possible by a partnership with the SUNY Polytechnic Institute, includes a major expansion of Athenex's North American headquarters at the Conventus Building in Buffalo, as well as the creation of a state-of-the-art, 300,000 square foot manufacturing facility in Dunkirk. The combined projects are expected to yield a $1.62 billion investment over ten years from Athenex, along with $225 million from New York State. "Western New York's economic transformation has captured the attention of companies and investors around the globe," said Governor Cuomo. "The business development environment in and around Buffalo has made it clear to cutting-edge companies that this is the right place to put down roots and thrive. Whether it's pharma-based development, medical research, clean technology or advanced manufacturing, this region is defined by incredible opportunities and potential for growth. I am proud to congratulate Athenex – which could have gone anywhere – on beginning this exciting new chapter, creating good-paying jobs and further strengthening the region's and state's economy." Dr. Johnson Lau, Athenex CEO and Chairman said: "We have been incredibly impressed by Governor Cuomo's leadership to attract significant new jobs within New York State. His commitment to economic development has successfully permeated an impressive ‘Open for Business' culture we have not seen anywhere else. We also want to thank Dr. Alain Kaloyeros at SUNY Polytechnic Institute. This collective leadership in New York is accelerating the transformation of the State's economy into a global leader of next generation manufacturing across many industries. With this partnership, millions of cancer patients around the world will benefit from the oncology drugs made in New York." Dr. Alain E. Kaloyeros, founding president and CEO of SUNY Polytechnic Institute, said: "This one-two punch for Buffalo and Western New York by an established and respected home-grown company like Athenex is another clear sign that Governor Andrew Cuomo's innovation-driven economic development strategy is powering job creation and revitalization across Upstate New York. For a company that already operates around the world to make the business decision to grow in New York speaks volumes about what Governor Cuomo has built. The workforce, attitude, and momentum in Buffalo and across Upstate has New York competing – and winning – on a global scale." Howard Zemsky, President, CEO and Commissioner, Empire State Development said: "This significant expansion by Athenex, through a combined state and private investment, not only reinforces the dynamic business climate that has taken hold in Buffalo and Western New York, but it validates Governor Cuomo's vision for the creation and development of a local economy that attracts outside business interests and, in the case of Athenex, keeps a homegrown company in the community that fostered its initial development. This is a perfect example of the Governor's determination to support business development in our region through unique public/private partnerships that will provide cutting-edge, good-paying jobs that are sustainable." Dunkirk: The state will invest $200 million to create the High Pharmacy Oncology Manufacturing Facility, which Athenex will use to manufacture sterile high potency oncology drugs in a specialized, controlled environment for shipment around the world. These drugs are some of the most important oncology drugs globally for patients suffering from cancer. The plant will also specialize in manufacturing oncology pharmaceutical products, which often show up on the FDA's drug shortage list. A specialized plant such as this has not been built in North America in over 15 years. The facility will be located off Lake Shore Drive East (Rte. 5), just northeast of the Dunkirk city line. Athenex will invest a minimum of $1.52 billion in the High Pharmacy Oncology Manufacturing Facility and it will create 900 jobs in the Dunkirk area. The state will own the facility and tools purchased for it. 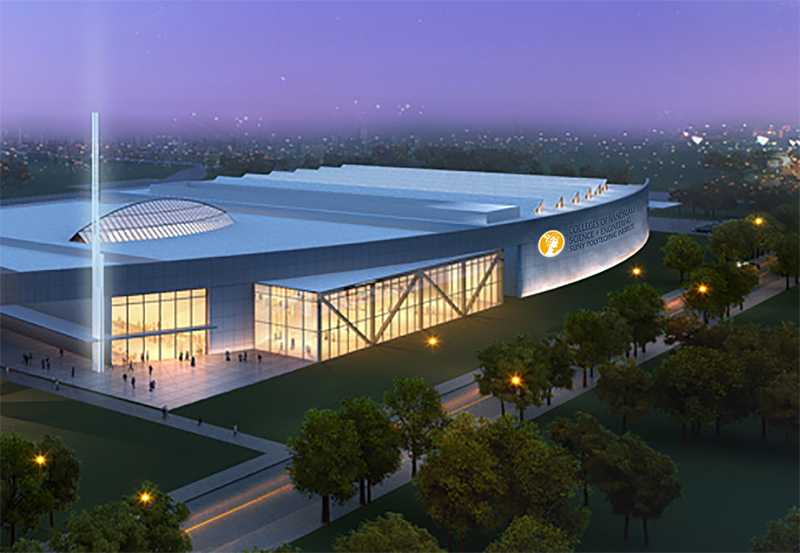 A rendering of the facility can be viewed here. Buffalo: The state will invest $25 million to expand and improve the sixth floor of the Conventus Building on the Buffalo Niagara Medical Campus. Athenex will occupy 51,000 square feet under a long term lease for its North American Headquarters, a formulation product development center and a pilot plant, where oncology products are perfected and refined before the technology is transferred for large scale production in Dunkirk. Athenex will invest a minimum of $100 million and is expected to create a total of 500 jobs in Buffalo. The state will lease the 6th floor space and sublet it to Athenex for a ten-year term with an option by Athenex to add on an additional ten years. Construction in the office space started August 2015; lab work will begin soon and is expected to be completed this fall. The partnership with New York State secures the Athenex's presence and growth in the state and provides for significant high paying new jobs in multiple locations in Western New York. This partnership also accelerates the goal of converting investments made in medical research into long term sustainable manufacturing jobs in high tech pharmaceutical products. Today, Athenex is global with multiple offices and manufacturing facilities located in: Buffalo and Clarence, NY; Cranford, NJ; Taipei, Taiwan; Hong Kong; and Chongqing, China. Athenex's large investors include some of the most successful technology entrepreneurs in the world such as Ma Huateng, named in 2014 by Time Magazine as one of the most influential people in the world and one of China's most successful investors. The Athenex Board of Directors reflects its global presence and includes such participants as Kim Campbell, the 19th Prime Minister of Canada and Song-Yi Zhang, former Managing Director in M&A and Co-Head of Asia Infrastructure and Utilities Group. Congressman Tom Reed said: "We care about the working families that hope to make Chautauqua County and the rest of Western New York a place to call home for generations to come. For too long, these families have borne the brunt of a struggling economy and thankfully that is about to change. It's only right that we work together across party lines and all levels of government to make New York State, and Chautauqua County, more competitive. Today, we can celebrate these efforts and be glad that we will bring over 900 quality, family sustaining jobs back from out of state, and around the world. We couldn't be more pleased by the news and want to thank Governor Andrew Cuomo, State Senator Cathy Young and State Assemblyman Andy Goodell for standing with Chautauqua County and making this investment in Western New York." Senator Catharine Young said: This announcement – hundreds of jobs being created and more than a billion dollars being invested right here in Dunkirk – is proof that things are moving forward in Western New York. Our region is stronger, more prosperous, and more competitive today because of Governor Cuomo, and I am thrilled that we are continuing to build on that progress not just today – but in a way that will have a positive impact for years and years to come. Senator Tim Kennedy said: "Today we're seeing another example of how Western New York continues to thrive and reach new heights of opportunity. The partnership between Athenex and New York State will create nearly 2,000 jobs and bring another $1.6 billion to the region – and that's a development that we'll continue to see the benefits of for years to come. We are so proud to have a company like Athenex, which is doing cutting-edge work in cancer therapies and drug development, right in our backyard and right in the growing Buffalo Niagara Medical Campus. I applaud Governor Cuomo for recognizing the value that Athenex brings to our region and investing state dollars to expand their footprint in Western New York. Assemblyman Andy Goodell said: This is easily one of the most exciting announcements for Dunkirk and Chautauqua County that I've seen as a state legislator, and I'm sure the same is true for many of you who have lived in the region for years like me. Athenex's expansion will create hundreds of good-paying jobs and bring more than a billion dollars of private sector investment right here to Dunkirk. I'm proud to stand with Governor Cuomo today for this exciting announcement that will continue to bring future growth and prosperity to Chautauqua County. Assembly Member Crystal Peoples-Stokes said: "Yet again, Western New York is continuing to make leaps and bounds of economic progress. Thanks to the Governor's support, we're seeing yet another high-tech company put down its roots in Buffalo and stake its future on the success of our highly-skilled workforce. I'm proud to see Buffalo's resurgence continuing strong, and I commend the Governor and the state for helping us get the economy running like never before." Erie County Executive Mark Poloncarz said: "Today's announcement once again demonstrates Governor Cuomo's commitment to attracting business growth and creating real opportunities for the people of Erie County. The arrival of Athenex is another sign of our economic renaissance and I look forward to seeing the pharmaceutical industry grow in this region for years to come." Chautauqua County Executive Vince Horrigan said: I am thrilled to see Athenex staking their future successes right here in Chautauqua County. This announcement will mean benefits to our community years into the future, and it puts us on the map for other private sector businesses to see in a way that is truly unparalleled. Governor Cuomo's support in making this happen has been tremendous, and I look forward to working with him again in the future to continue growing the economy in Chautuaqua County. Buffalo Mayor Byron Brown said: "Thanks to our partnership with Governor Cuomo, Buffalo is seeing a new level of growth and private sector confidence. By creating private investment and good paying jobs, the opening of Athenex, a home-grown Buffalo business, sends a clear message that Buffalo's economy continues to grow stronger. This is a significant investment in the future of Buffalo and I thank Governor Cuomo for his commitment to helping us continue our city's rebirth." Dunkirk Mayor Willie Rosas said: "This is a tremendous day for Dunkirk and our part of Chautauqua County. I'm excited to see Athenex move in, bringing with them more than a billion dollars in investment and nearly a thousand new jobs. This shows that the state and Governor Cuomo truly are committed to helping our region succeed, and I can't wait to see the economy continue to grow for future generations." Buffalo Niagara Enterprise President & CEO Thomas Kucharski said: "The significant investment and job creation announced by Athenex and Governor Cuomo makes two very important statements. The first is that communities in our southern tier can absolutely succeed in attracting meaningful projects. The second is that when it comes time to commercialize the award winning and life changing research and development that occurs in our life sciences industry here, we can succeed in keeping that too."